This article was first published on IEEE Spectrum Automaton and is republished here with permission. For the IEEE version, click here; for the unabridged version, continue reading. Collaborative robots (also called co-bots) are robots designed to assist humans in the performance of their tasks, i.e., to work jointly on a project. Because co-bots are almost plug and play — and very low-cost — SMEs are buying and the segment is quickly growing. There are many reasons for the emergence of collaborative robots: to handle ergonomically challenging tasks, using them alongside humans in small-spaced electronics assembly lines, using them because they are affordable, using them because they are plug and play and easily trainable, using them for their flexibility to handle short runs, and using them to offload repetitive and boring jobs. Co-bots are also emerging because sensors and computer power have become so cheap that they are driving down the cost of robots and making them more available to businesses of all sizes. Initially driving this movement was the EU SME Robot P-P-P started in Europe in 2005 with a goal of increasing worker productivity so that labor-intensive tasks wouldn’t be off-shored. Recently the movement has been promoted by the launch of the Baxter robot and its developer and chief promoter Rodney Brooks. And by the ease-of-use factor: co-bots are easier to train and deploy than big industrial robots. Most professional service robots are collaborative by design; hence co-bots aren’t just for SMEs or for manufacturing use. Offices, homes, labs, warehouses, farms, distribution centers, hospitals and healthcare facilities are all enabling service robots to help them do their jobs better. The market is open-ended but current uses for co-bots include machine tending, material handling, assembly tasks and packaging. They also pick and place, count and inspect. As more co-bots are deployed, more uses will be discovered. In a human-machine study conducted by an MIT professor at a BMW factory, it was shown that teams made of humans and robots collaborating efficiently can be more productive than teams made of either humans or robots alone. Also, the cooperative process reduced human idle time by 85%. At present, sales of collaborative robots represent 5% of the overall robot market but have strong growth expectations for the future. In fact, the market acceptance of collaborative robots and also drones are expected to be significant drivers in non-industrial robotic growth. This non-industrial growth will be split and different for differing aspects of the service robotics marketplace, but as Tractica (a Colorado research firm) projects, growth will be significant, exponential, and near-term. The collaborative robotics sector is expected to increase roughly tenfold between 2015 and 2020, reaching over $1 billion from approximately $95M in 2014. Insiders suggest more rapid growth: that collaborative lightweight robots will become the top seller in the industry in about 2 years, selling hundreds of thousands and with prices falling to the $15,000-$20,000 level. In their September 2015 report, British market research firm TechNavio forecasts the global collaborative robots market to grow at a compounded annual growth rate (CAGR) of 50.88% to 2019. Industrial robots are caged to keep humans safe and out of harm’s way. Service robots are meant to safely leave the cage while doing tasks for humans. Collaborative robots come in all sizes and shapes and have integrated sensors and soft and rounded surfaces for safety purposes and to reduce the risk of impact, pinching and crushing. The biggest safety feature of collaborative robots is their force-limited joints, which are designed to sense forces due to impact and quickly react. 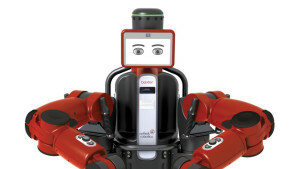 Rethink Robotics, a venture-funded Boston-based robotics firm headed by Rodney Brooks, markets a two-armed industrial robot named Baxter with a base price of $25,000 that can carry out relatively advanced functions such as removing defective items from product lines, packing finished items into boxes and performing basic quality-control inspections. Additional purchase costs include a mobile pedestal ($3,000), gripper ($1,750), and a 2-year hardware and software service contract ($7,000). With an expected useful life of three years, 40 hours of operation per week translates into an average cost of around $4/hour. Though this comes before additional expenses for electricity, maintenance and repair, it remains highly competitive with manufacturing wages in the emerging world. 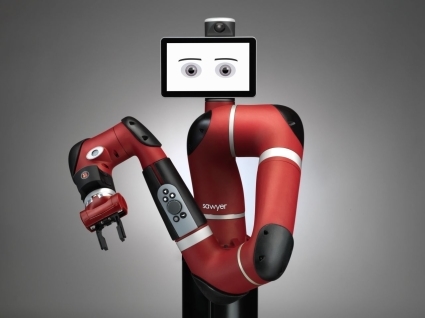 Rethink also sells a narrower one-armed robot named Sawyer with a base price of $29,000 and similar additional costs as Baxter. Sawyer is designed primarily for machine tending, circuit board testing, and other precise, repetitive tasks, specifically those that take place in the middle of a long assembly line of electronics products. There’s a huge need for a robot that can do tasks like these, especially in Asia, and that’s the market Rethink is going after with Sawyer. “We’re moving into mass electronics manufacturing,” said Brooks in an interview connected with the receipt of a funding round for scaling up sales into China and the promotion of a distribution agreement with Shanghai Electric. Universal Robots, a Danish startup whose one-armed, 6-axis robots have had significant success in the marketplace. At this time they are the market leader producing at an annual run-rate of 5,000+ co-bots. They recently added a third robot to their product line and now have over 200 integrators and distributors around the world and thousands of sold robots at work in SME and larger factories. All three of their robots are identical except in size and carry. The UR3, UR5 and UR10 can carry up to 3, 5 and 10 kilograms of load (6.6, 11 and 22 pounds). Pricewise, the UR10 costs $45,000, the UR5 costs $35,000 and the new UR3 is priced at $23,000. The UR3 can handle payloads of up to 3 kg (6.6 lbs), and perform tasks that include: mounting of small objects, gluing, screwing (it can tighten applying the correct torque), operating tools, soldering and painting. It has a reach radius of 500 mm (19.7 in) allowing it to be deployed in tight spaces. Universal has found another and perhaps bigger use of co-bots through their work with automaker BMW, which already has 7,500 industrial robots at work in their factories. BMW has been testing UR robots alongside factory workers who had been tasked with ergonomically challenging assignments. The robots were quickly trained for those tasks and performed perfectly while freeing up the worker to do even more of what he or she was doing. The results of the tests turned out so well that a BMW spokesman, who oversaw the testing, said that it was likely that BMW would soon double or even triple their number of robots by the use of these low-cost, portable, easy-to-program, safe to work alongside robots. (With that kind of endorsement and prospect for the future, it’s easy to see why Teradyne paid $350,000,000 for Universal Robots. MRK-Systeme GmbH, a German integrator of industrial robot technology, offers two collaborative software packages which work, at present, with KUKA’s 5SI low-payload robot: SafeGuiding for moving the robot manually to teach it applications, and SafeInteraction which provides five human-robot safety functions to the robot control system. 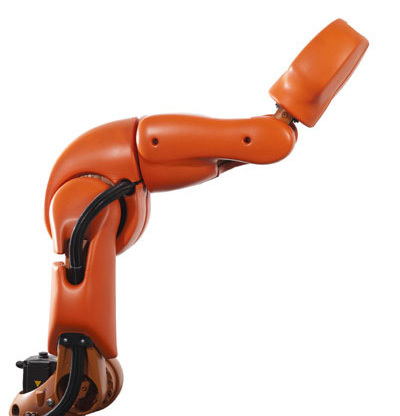 They also integrate Kuka’s robot into their own branded KR 5 SI one-armed robot. F&P Personal Robotics, a Swiss spin-off from the University of Zurich, offers a line of co-bots emphasizing safety and functionality. Their robots are context aware, use soft material covers, have limited and controlled force sensors, motor torque is limited by the controller, and their software uses deep learning AI to enable their robots to adapt and improve based on human feedback. F&P recently introduced their new P-Rob 2, an all-in-one robotic arm, with sensors and software embedded in a PC as control unit in the base of the robot. Bosch developed the APAS line of co-bots and has deployed 50 of them, mostly for internal operations. Safety is provided by a special sensor skin and software controls. Training is done using a graphic user interface on a teach pendant and the robot can be outfitted with an optional 3D camera system. The Bosch APAS system was the first to be certified as an assistance system, i.e., safe to work alongside with human workers. 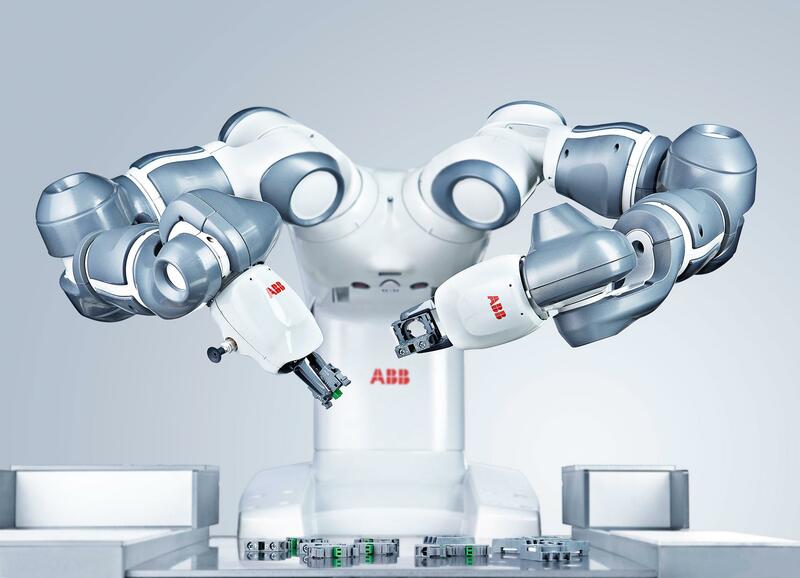 ABB, one of the Big Four global industrial robot manufacturers, recently launched a two-armed collaborative robot capable of advanced manual tasks. Called YuMi, the robot is able, with a high degree of precision, to handle small parts assembly such as mechanical components for watches, smartphones, tablets, PCs and other consumer electronics. The YuMi is dexterous enough to be able to thread a needle. 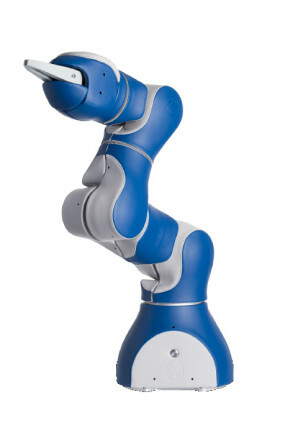 Early in 2015 ABB acquired gomTec, a startup producing a one-armed co-bot named Roberta. gomTec was a 25-person German company headed by Bernd Gombert, a mechatronics engineer with 100+ patents and who was the head of a DLR project which became KUKA’s LBR iiwa robot (see below). Roberta is a family of 6-axis modular co-bots using custom-made brushless motors and harmonic drives. Safety sensors and joint torque sensors can be optionally added. ABB is in the process of integrating a new intuitive programming user interface and rebranding Roberta to ABB’s brand and expects to launch in Q1 or Q2 of 2016. Because ABB is so big and has such an extensive sales, distributor and integrator marketing force, they are expected to quickly penetrate the small parts assembly market with their lineup of plug and play one- and two-armed low-cost co-bots. MABI Robotic is a Swiss manufacturer of industrial robots. Their slick precision Speedy 10 one-armed table-top robot is lightweight, fast, easily trained but unclear as to whether it is safe to work alongside. FANUC Corp makes CNCs, servo motors, lasers and a full line of industrial robots. Fanuc is the biggest of the Big Four robotic providers. Their CR-35iA is their first collaborative robot and it can carry the heaviest load of all the co-bots so far announced, 77 pounds, and has full safety compliance using soft rubber skin and multiple sensors including either a vision sensor or a 3D area sensor. The CR-35iA is too big for work in a narrow space such as on an electronics assembly line but it’s ability to carry heavy loads opens it up to other tasks better suited for a robot than a human such as inserting a spare tire into a new car’s compartment. Smokie Robotics, a Tennessee startup, produces a modular one-armed robot configurable for 3 to 7 DoFs. Their OUR-1 robot uses open source architecture enabling easy integration into existing production systems and their OUR-2 robot will be available in Q1 2016. KUKA Robot Group, headquartered in Augsburg, Germany, is one of the global Big Four producers of industrial robots. Their first foray into co-bots is the LBR iiwa (lighweight robot, intelligent industrial work assistant) which comes with the ability to carry 15 or 30 pounds of payload and the Sunrise controller. The robot has 7 joint torque sensors which enables the control system to detect externally applied forces. The robot has the sensitivity of a human and can quickly feed information through the controller to safely control the motions of the robot. The KUKA LBR iiwa fully complies with the industry safety standard ISO 10218 and the new standards for human-robot collaboration ISO 12100 and ISO 13849. Also, the LBR robot has been at work in the Daimler transmission plant since it was first tested in 2009. It has been used in the processing of more than 500,000 transmissions since then. Although the robot is programmed to perform automatically, it approaches objects carefully and adjusts to changed conditions. For example, if a workpiece is not optimally positioned, the robot adjusts its motion sequence accordingly using it’s SafeOperation software to restrict or monitor workspaces and safety zones between machines or between humans and machines. KUKA, like the other Big Four vendors, has a global marketing capability consisting of sales people, distributors, integrators and resellers. If they can get the selling price down from its present $100k+, they have the ability to become a major player in the SME market – a significant breakthrough expanding KUKA’s products into that arena. 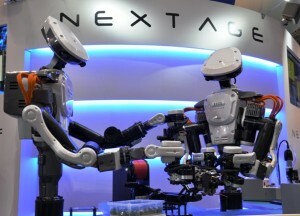 Kawada Industries makes the Nextage two-armed industrial robot. Safety is handled by the stereo vision cameras in the head and by using low-power motors and elbow controls so that don’t jut outwards even when both arms are in operation. Over 150 of the $60,000 robots have been sold and are at work in factories in Japan, according to Discuss Japan in a May, 2015 report. Companies of all types and sizes are finding strategic reasons to acquire or invest in robotics and robotic ventures to add to their arsenal of products and services as the metrics of ownership and deployment become more affordable. Universal Robots has a big head start. 2016 will likely see them continue to lead, but KUKA, ABB and FANUC will begin to make inroads and experiment with different prices. By the beginning of 2017, the competition will become even more intense as the number of co-bots sold approaches 15,000 units – $0.5 billion in sales revenue. It’s still too early in the evolution of co-bots for provider consolidation, but some systems are sure to be preferred because of their flexibility, ease of training and support base. The SME marketplace is huge – 6 million companies worldwide and almost 70% of the world’s manufacturing. A few low-cost plug and play robotic tools can easily fit into the manufacturing process in most of these companies, which is why it is easy to imagine that co-bots could be on track to sell hundreds of thousands of units beginning as early as 2018.